If you and your family love ice cream, making it at home using fresh ingredients free from additives is a good idea. There are lots of things to consider when you are buying an ice cream maker. The first thing you will need to think about is how often do you make ice cream and how much do you make. You also need to think about how much counter and cupboard space you have or whether you have a big and cold enough freezer. The best home ice cream maker fits your space, needs and budget. Electric with rock salt and ice: These machines are just a step above the manual crank but they use an electric motor to churn the ice cream. The bowl must be surrounded by ice and salt which helps freeze the mixture as the arm churns it. You have to add your own ice and salt, which can get a little messy; however they tend to be the most cost effective type of machine to purchase and you can make a large quantity in one batch. Pre-Freeze Bowl: This type of machine requires you to pre-freeze your bowl. This can take up to 24 hrs and you do need to make space in your freezer for the bowl. The inner bowl is surrounded by liquid which freezes, and this chills the ingredients when you are making the ice cream. Compressor: These machines do not require you to freeze the bowl before hand. You can just add in the ice cream mixture and go as it acts as a mini refrigerator. These are bigger and more expensive but they give you the best quality of ice cream and you can make several batches of different flavors in one shot. Gelato: Gelato and ice cream seem very similar; however they are made quite differently. Gelato has less air incorporated and is not frozen as much. This means you need to buy a machine designed for gelato if you want to make it. This is a pre-freeze bowl type. The double insulated bowl needs to be frozen for at least 12 hours before starting. 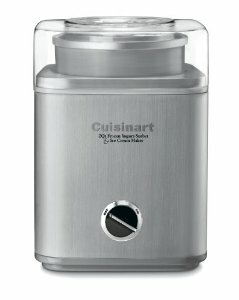 The Cuisinart ICE-21 frozen yogurt and ice cream maker is a medium device at 10.8 x 10.8 x 15.8 inches, but it is light so can easily be stored away. It has a reasonable sized bowl at 1.5 quarts and is well made and durable. The mixing paddle makes a soft serve style ice cream quickly in about 15-20mins. If you want it more frozen you’ll have to put it in the freezer for a while. It has a locking transparent lid with an open spout through which you add your mixins. It can be taken apart for easy cleaning, but does need hand washing. Issues with this model are its lack of lid on the spout, which can mean that ice cream may overflow if you forget about it because there is no auto-shut off. However this also means you can add ingredients like nuts and chocolate chips without disturbing the freezing process. It is a cost effective, simple to use machine and is the best-selling maker on the market. This is a similar type to the one above but with a more powerful motor and sleek stainless steel housing. It allows you to make a lot of high quality, creamy ice cream quickly. The Cuisinart ICE-30BC has a larger capacity at 2 quarts, and a freeze time of 20-25mins and similar to the 21BC has no auto-shut off. It makes a thicker ice cream than the above mentioned machine. It is also smaller in terms of counter space at 8.2 x 8 x 11.2 inches. Again, you need to pre-freeze the bowl. As it is a 2 quart bowl you will want to check that you have enough freezer space. This model spins the bowl, rather than the mixing arm and the arm doesn’t get right up next to the sides of the bowl. It has an opening in the lid that allows you to add ingredients as you go but make sure you allow for room for the ice cream to expand. This machine is great if you want to make large batches of high quality ice cream but some users say that they would like the finished product to be a bit more solid. According to frozen yogurt maker reviews, this is also the best frozen yogurt machine for home use. This ice cream maker is the compressor style. The main advantage of this is that you do not need to pre-freeze the bowl or add salt and ice for cooling; you can just add your ingredients and turn it on. The Cuisinart ICE-100 allows you to make batches one after the other with no wait time. It is also quieter than the previous models. However, this machine does require more space as a result at 16 x 12 x 9 inches, and is much heavier. It has the added advantage of having a gelato paddle as well, so you can make both ice cream and gelato in this machine. It does take a little longer to churn than the other machines at 40-60 mins, however, it has a timer so you do not need to worry about forgetting it. Additional ingredients can be added via a transparent lid on top. It features touchpad controls and an LCD panel and even a 10 minute “keep cool” feature that comes on once the machine stops. A recipe booklet is included. While this machine costs more, it is great for real ice cream enthusiasts, as you can make many different types of ice creams and gelatos in quick succession whenever the urge strikes! This is the electric salt and ice type. It uses a plastic bucket and churn and an aluminium canister, which you place inside the bucket, and layer in your ice and salt between the two. The Nostalgia Electrics ICMP400BLUE model has a massive bowl at 4 quarts, but this results in it being a large unit at 15 x 17 x 16 inches. It is, however, very light so you can store it away if you have the cupboard space. It only takes 25 minutes to produce great ice cream. The large bowl size means you can make a batch of ice cream for large dinner parties. It does require you to make up the layers of salt and ice before you begin, which is a little extra effort, however, this is a highly cost effective machine, making lots of ice cream quickly and easily. Some customers say that placing the canister in the freezer for a a few hours before using helps the ice cream set faster. Again, this is an electric type where you add in the ice and salt. The Hamilton Beach 68330N also has a huge bowl and is quite large at 15.3 x 12.5 x 11.1 inches. However, it is very light and easily stored. It is both smaller and cheaper than the Nostalgia electric mixer, while still producing the same amount of ice cream. It still requires the extra effort of adding in the ice and the salt. However, the quality of the mixer is not quite as good and you may need quite a lot of ice and salt to keep the temperature low enough for the mixture to set. If you want a cheap and easy machine that you can use occasionally, then this could be the machine you are looking for. The Cuisinart ICE-45 is great for the kids during the summer. The pre-freeze bowl can hold 1.5 quarts of soft serve ice cream that can be made in 20 mins, and it even has a built in dispenser for 3 types of mix-ins and a place to put the cones. For the amount of ice cream it can make it is a little expensive, but it is perfect for the soft serve lover. It dispenses the ice cream with the traditional soft serve swirl. It comes apart so is easy to clean. If you have kids over during the summer, and want something fun to do with them, then this could be the machine for you. ← What is the Best Stand Mixer for Bread Dough?